RedVector is excited to announce the launch of another mobile-ready eLearning course! 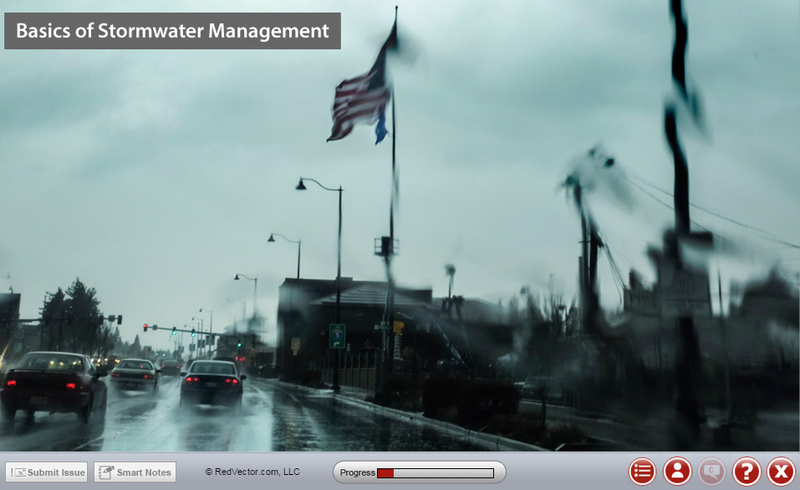 This hour-long course, titled Storm Water Management: Storm Water Pollution Prevention Plan (SWPPP), is led by safety professional Jon Wallace, who has worked with RedVector on several courses and has over two decades of safety experience. Proper storm water management is critical to ensure safe drinking water for all of us. In addition, the EPA can levee substantial monetary fines as well as criminal prosecution for violators of EPA storm water regulations. This course will discuss the environmental impacts of storm water runoff, the NPDES storm water program, and the elements of a storm water pollution prevention plan. By the end of this RedVector eLearning course you will be able to identify pollutant sources that may affect the quality of storm water discharges associated with manufacturing facilities and construction activity, select prevention strategies for storm water pollution, recall the federal requirements for storm water runoff for manufacturing facilities and construction sites, list who is required to get NPDES permit coverage, name the required element in a Storm Water Pollution Prevention Plan and match the rules and responsibilities in a Storm Water Pollution Prevention Plan. RedVector is the leader in online training and education and has over 2,000 courses in our library taught by over 200 subject matter experts. Be sure to follow our blog and check us out on Facebook and Twitter to stay up-to-speed on all the latest eLearning news and course launches! For more information about this or other RedVector courses, contact our client support department today.